Come and trace your family tree in Angus and walk in the footsteps of your ancestors. There is a rich source of local knowledge and history ready for you to unlock, with the help of library, museum and archive resources throughout the area. Angus has records going back many centuries through parish records and censuses. Angus Archives was established to help preserve the written heritage of Angus over the last 800 years. The centre contains a wealth of material for genealogists, both professional and amateur. Download A Guide To Tracing Your Family History. This useful booklet is an easy to follow guide on how to research your family history and uncover the stories behind the names and dates. Alexander Shanks was the inventor of the modern lawnmower, who lived in Arbroath. 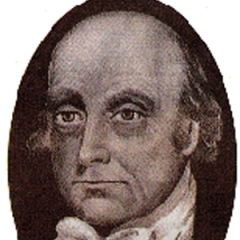 While credit is usually given to the Englishman Edwin Budding (1795 – 1846) for the invention of the lawnmower, it is Shanks’ machine which was the direct predecessor of the modern mower. Shanks’ innovation was a machine which rolled the grass as well as mowing it. 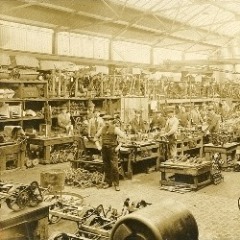 Although Shanks himself died at a young age, his son showed the mower at the Great Exhibition (1851) which led to a successful business that continued into the 20th century, supplying mowers to cut the tennis courts of Wimbledon, the cricket grounds at Lords and the Old Course at St Andrews. Bon Scott is widely acknowledged as one of the wild men of rock music but it is less well-known that the leather-clad lead singer of Australia’s most famous rock band was brought up in the Angus town of Kirriemuir. Born in 1946, Ronald loved the sound of the drums and hammered out rhythms on his mum’s bread board and biscuit tins. When Ronald was aged 6, his family emigrated to Australia. Ronald quickly settled in at school in Melbourne, where he acquired a new name – Bon (as in Bonnie Scotland) Scott. He also acquired a new hobby – playing the bagpipes. After falling into trouble and a spell in a detention centre, Bon vowed he would never fall out of line again. Bon Scott put all his energies into music, playing drums and singing with several Australian bands. Then, in 1974, Bon met two other Scottish ex-pats who were making their names in the Australian rock world – Angus and Malcolm Young of up and coming rock band, AC/DC. Fame and fortune followed and in 1980 Bon Scott tragically died of alcohol poisoning. 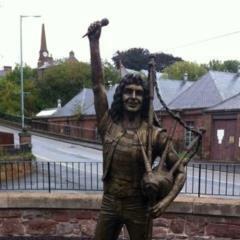 Visit the Bon Scott statue in Kirriemuir, installed in 2016 to commemorate Bon Scott. The town earned itself a notorious reputation in the 17th century, due to the number of women burned for witchcraft. The executions took place on land just north of the town which is still known as “The Witches’ Hollow”. The town retains some particularly gruesome instruments of that period, in particular the Forfar Bridle. This was a hinged metal collar with a metal prong to the front which entered the mouth as the collar was fastened around the victim’s neck, it acting as a gag during the execution. According to the town council’s records, the witch hunt appears to have been triggered in 1661 by an argument between Isobel Shyrie, a poor woman who was unable to pay her taxes, and Baillie George Wood, a tax collector. During the quarrel, Isobel cursed Baillie Wood. When the unfortunate man suddenly dropped dead, all fingers pointed at Isobel. In those days, it was considered that there were three ways to spot a witch – she went by a nickname instead of the name she was baptised with; there was a mark on her body that was impervious to pain; or she practiced ‘malefice’, which was the use of supernatural means to do evil. Isobel was widely believed to be guilty of malefice, which was sufficient for her to be sent to the dungeon below the Tolbooth, situated on the road next to the Town House in Forfar town centre. 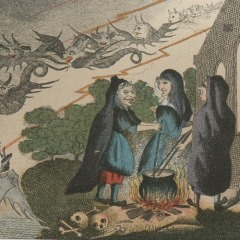 Find out more about the Forfar witches at the Meffan Museum. 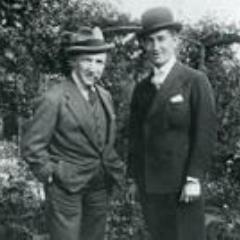 Harry Lauder arrived in Arbroath at the age of 12 after the sudden death of his father. His mother, Isabella, had been born and brought up in Arbroath, and, with seven children and another on the way, she decided to move back to the town of her birth. It was in Arbroath that Harry’s talents as an entertainer were first spotted, when he entered a singing competition in the John Street Hall. After only two years in Arbroath, the family moved to Hamilton, where Harry worked in the coal mines. After ten years of working in the mines and performing on stage whenever he had the chance, Harry was offered a full-time job in a concert party. He was a great success and before long, had his own touring company. Audiences the world over were soon singing along with his many tunes, including I Love A Lassie, Roamin’ in The Gloamin’ and Keep Right on to the End of the Road, which he wrote specially for the British soldiers who were fighting in the First World War. In 1919, he was knighted for his charity work and his fame continued to grow until he truly was one of the world’s first superstars. Scottish mountains over 3,000 feet are known as Munros – a name given to them in honour of Sir Hugh Munro, the Angus laird who recorded every one of these 283 summits in his ‘Tables of Heights’ – and climbed to the top of all but three. 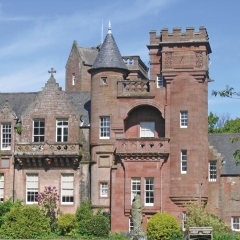 Sir Hugh was born in 1856 and was the oldest son of Sir Campbell Munro of Lindertis, an estate between Kirriemuir and Alyth, with outstanding views up to the Angus Glens. In 1889, Sir Hugh became one of the founder members of the Scottish Mountaineering Club and the editor of the club’s journal asked him if he would list all the Scottish mountains over 3,000 feet – a task which particularly appealed to the meticulous side of Sir Hugh’s nature. Only two years later, the Scottish Mountaineering Club published their ‘Tables giving all the Scottish mountains exceeding 3,000 feet in height’. The fact that Sir Hugh had listed almost 300 mountains caused great excitement as, until then, it was widely believed that Scotland only had 30 or so mountains over 3,000 feet. 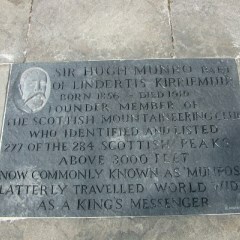 And so began the pastime of Munro-Bagging. Discover walking in Angus from gentle strolls to munro bagging! 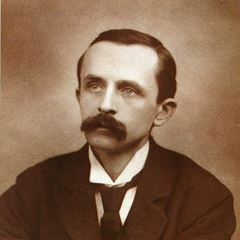 James Matthew Barrie was born in a cottage in Kirriemuir on May 9, 1860, the ninth child of a handloom weaver. Barrie was a natural storyteller from a young age. Kirriemuir provided Barrie with the inspiration for the stories which first brought him fame and fortune. In 1904, Peter Pan was performed for the very first time. Barrie’s tale of the boy who refused to grow up, Wendy, the Lost Boys, Captain Hook, Tinkerbell and the Wendy House (which was based on Barrie’s first theatre – the wash house) was an astounding success and, only two years later, had grossed over £2 million. Barrie’s success as a playwright was guaranteed and he was only too happy to share his good fortune with the people of the town where he grew up and where he was still a frequent visitor. As a boy, Barrie would often climb up Kirrie Hill to watch the cricket matches that were played on the plateau on the top of the hill and in 1930, Barrie gifted the town with a specially-designed cricket pavilion. The cricket pavilion also housed a Camera Obscura, which to this day provides the most amazing views right across Angus. Barrie died in 1937. As a baronet, his funeral service could have taken place at Westminster Abbey but instead it was held at St Mary’s Episcopal Church in Kirriemuir. At his request, Barrie was buried in the family burial plot in Kirriemuir Cemetery. Today, it is possible to visit Barrie’s Birthplace and the Camera Obscura, a fitting reminder of JM Barrie’s legacy to the world. Born in Arbroath, James Chalmers was a weaver who moved to Dundee in 1809, becoming a bookseller, newspaper publisher and printer. He first suggested the adhesive postage stamp in 1834 and submitted his ideas to Parliament in 1839, which made Rowland Hill’s Penny Postal Service a practical proposition. Chalmers was buried in the Howff in Dundee, where the inscription on his gravestone proclaimed “Originator of the adhesive postage stamp, which saved the penny postage scheme of 1840 from collapse”. The first British person ever to successfully take to the skies in a hot air balloon was none other than a son of the manse from the Angus village of Fern. When he was only 18 years old, Tytler left Angus so he could attend medical classes at Edinburgh University. This enabled him to secure a job as ship’s surgeon in the Dundee whaling fleet but, after two voyages, he returned to dry land. His attempts to find a position in Edinburgh as a surgeon failed so, instead, he set up in business as a pharmacist. A few of years later he became editor of the second edition of the Encyclopaedia Britannica. While working on the encyclopaedia, Tytler was inspired by stories of balloon flights and decided to fly his own hot air balloon in 1784 from Calton Hill in Edinburgh. Tytler later created the concept of copyright in Scotland. Once he became widely-known, Tytler was well regarded by some in the late 18th century’s Scottish Enlightenment, particularly Robert Burns with whom Tytler collaborated in creating lyrics for Scottish ballads. 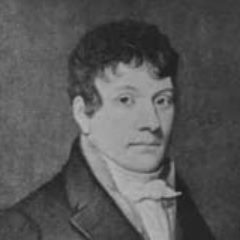 In 1792, Tytler, a member of a radical group “Friends of the People” was arrested for publishing an anti-Government pamphlet, at the time of the French Revolution. He later fled to Ireland and then to America where he continued to express his often-rebellious thoughts on paper, while creating the Universal Geography, an ancestor of the National Geographic. Remaining in exile for the rest of his life, Tytler died in 1804. Patrick Allan-Fraser was born in Arbroath, the son of a weaving merchant. He gave up commerce and embarked on an artistic career. Patrick married the young widow Elizabeth Baker of Hospitalfield and embarked on a programme of managing the estate, reversing his wife’s fortunes. An enthusiast for the arts and crafts movement, Allan-Fraser remodelled Hospitalfield into one of the finest 19th century country houses in Scotland. He lies buried in the Mortuary Chapel of his own design in Arbroath’s Western Cemetery. Hospitalfield later became an art school, at Patrick’s and Elizabeth’s bequest. Dedicated to contemporary art and ideas, Hospitalfield House is now a place to visit, learn and enjoy. The beautiful gardens are a must visit. 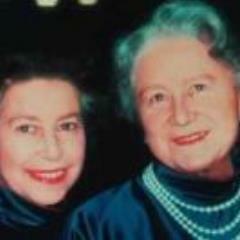 Queen Elizabeth, the Queen Mother, was born in 1900, the ninth child of Lord and Lady Glamis. Despite popular belief, Elizabeth was born in London but spent much of her childhood at Glamis Castle. Young Elizabeth was a keen explorer and loved exploring the gardens with her brother and taking walks into the village of Glamis to buy sweets from the local Post Office. Elizabeth was also a keen member of the Glamis Girl Guides. During the First World War Elizabeth was sent to Glamis for safety. Like other stately homes in Scotland, Glamis Castle became a convalescent home for the war wounded. Despite only being 14, Elizabeth was involved in caring for the wounded soldiers. Elizabeth’s second daughter Princess Margaret was born at Glamis Castle, the first royal baby born in Scotland for over 300 years. When the Queen Mother died, people from all over the world laid flowers at the gates of Glamis Castle. The beautiful set of gates at the entrance to the castle commemorates the Queen Mother. The Bell Rock Lighthouse is situated 11 miles off the coast of Arbroath in Angus and is the world’s oldest surviving offshore lighthouse. It was erected by Robert Stevenson between 1807-10. 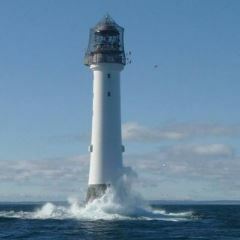 The Bell Rock lighthouse was a remarkable engineering achievement and today is still regarded as an engineering wonder. Brechin born Sir Robert Watson Watt, made the groundbreaking discoveries which led to the invention of the radar. From an early age, Robert showed a great interest in science and appeared likely to follow in the footsteps of his distant relative, James Watt, the inventor of the steam engine. Robert excelled at school and won a scholarship to University College, Dundee to study engineering from where he graduated with a BSc and was offered a position with Professor William Peddie, who introduced Robert to the seemingly endless possibilities of radio waves. Robert was convinced that radio waves could be used to detect thunderstorms, providing planes with vital protection from the havoc caused by lightning, which led to the realisation that radio waves might also be able to detect aircraft. In the mid-thirties, Robert’s work attracted the attention of the British Government, which was becoming increasingly aware of the threat posed by Nazi Germany. With war looming, Watson Watt’s discoveries lead to the design and installation of a radio defence system across the south and east coasts of Britain. Radar played a crucial part in the defeat of the Luftwaffe during the Battle of Britain and Brechin basked in the glory of Robert’s success. 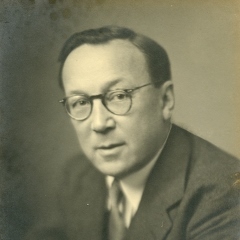 Although Robert modestly referred to his invention as ‘a gadget’, in recognition of his contribution to the discovery and development of radar, Robert Watson Watt was knighted in 1942.